Fortnite exists in that odd space between a public beta test and a full release. Epic Games’ online tower-defense, third-person action hybrid can be purchased right now; but it’s actually launching as a free-to-play title next year. The closest equivalent is a Steam Early Access game. An Early Access purchase grants access to the live game right now, as well as some extra loot. Fortnite’s laborious focus on grinding and digging through random loot mars an otherwise fun experience of scavenging, leveling, shooting, building, and defending with friends. We were on Floor 11, and we were in trouble. Our supply of Dust was reduced to dangerous levels after the most recent wave, and we could barely power the rooms around our crystal. Our healthy buildup of Industry and node access was crippled by our lack of power. We spread our heroes around to deter as many enemy spawns as we could, but still they came as we searched for the exit. Finally we took a gamble and opened several rooms at once, starting off a terrifying chain of enemies that would be our doom. Except one of the rooms contained the exit to the final level. We grabbed the crystal and ran through hordes of foes, using our last remaining food supplies to keep everyone alive until they reached the exit. We made it, but only just, and if the final floor was any indication there was a good chance we wouldn’t make it out alive. 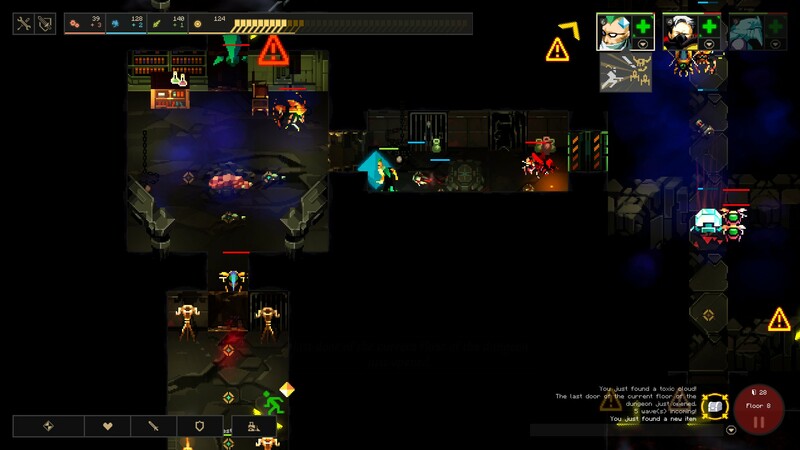 The scenario above is only one such experience from playing through Dungeon of the Endless, the latest game to explore the Endless Universe created by Amplitude Studios. Whereas their previous games, Endless Space and Endless Legend are Civ-like 4X empire management games, Dungeon of the Endless is, *deep breath,* a cooperative rogue-like tower defense dungeon crawler. If any of those terms spark your interest you may discover one of your favorite games of the year in this unique mash-up of genres.